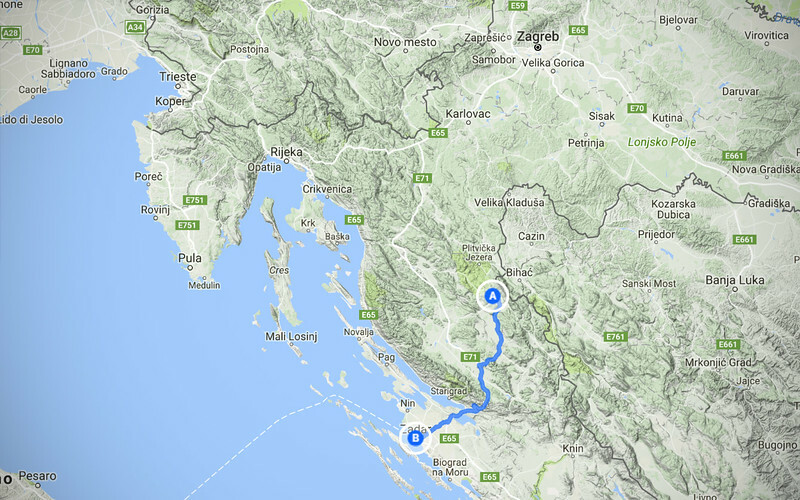 We are headed back to the shore, where we'll spend most of our trip following the coastal road southwards. 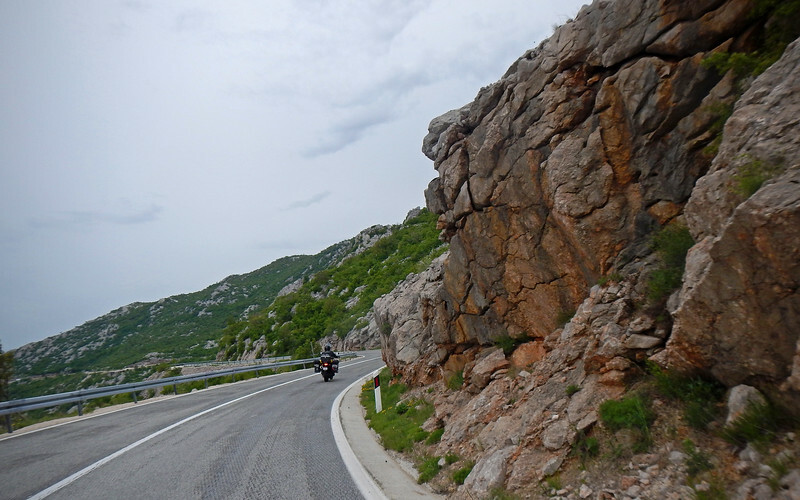 Neda has been dreaming of riding along the Adriatic Sea through Dalmatia ever since we started riding motorcycles, so this leg of our journey has been a long time coming. This is the last we'll see of the mainland for a while. Lots of sea in our future! Our riding days are pretty short these days - only an hour of riding today. 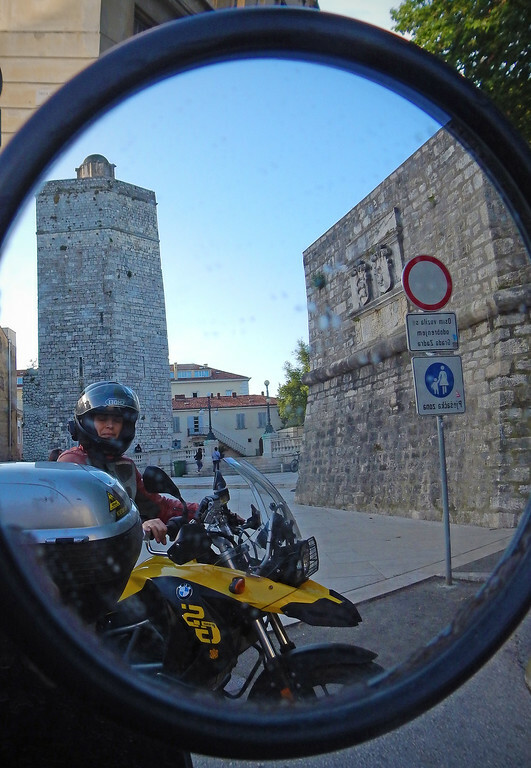 Partly to give our butts time to recover from the horrible dirtbike seats in Thailand, but also because there's lot to take in along the Adriatic. 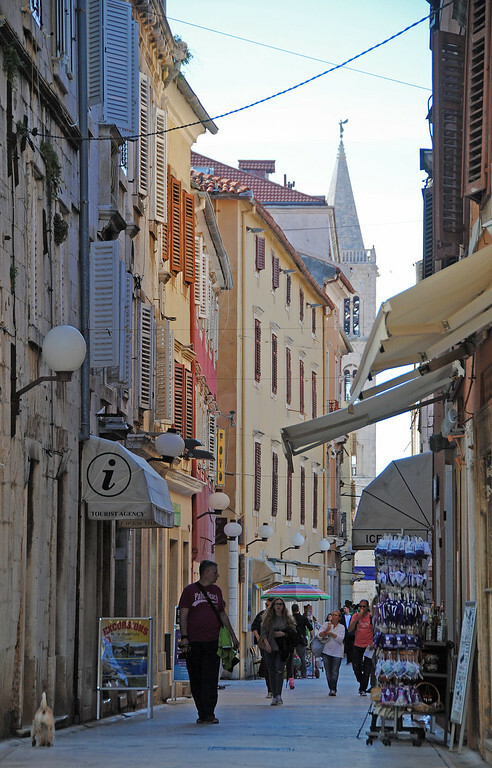 Our destination for the day is the coastal town of Zadar (pronounced ZAH-dar, not like RADAR). As usual, we find a cheap place outside of the city. 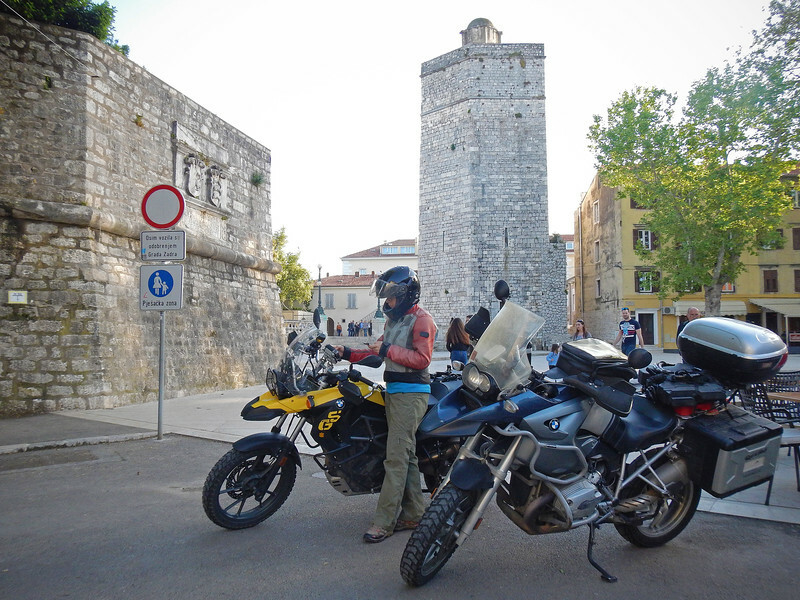 I'm so thankful Neda is able to chat with the owner in Croatian and organize the check-in while I offload the bikes. 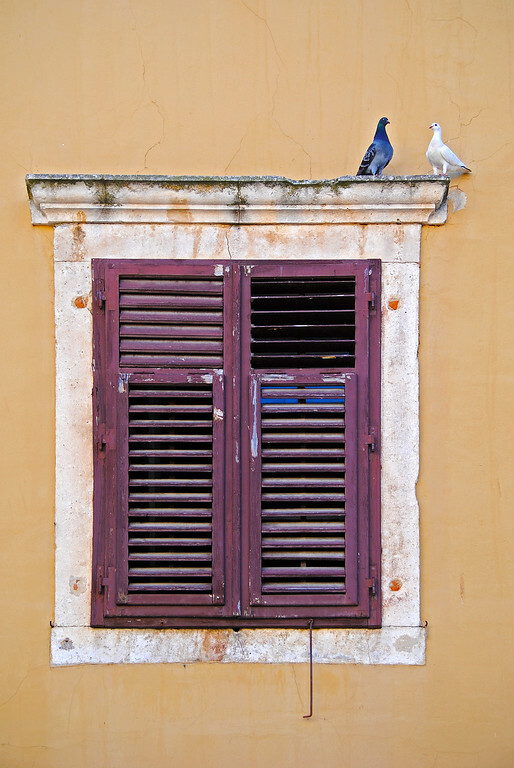 It's been a while since one of us could speak the local language while traveling. It makes things so much easier and less stressful! 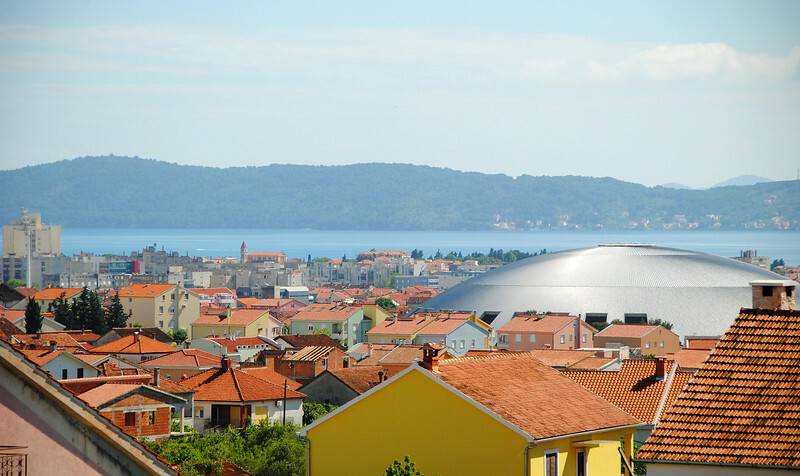 That's actually the Zadar cupola (dome) sports stadium just outside of our apartment. 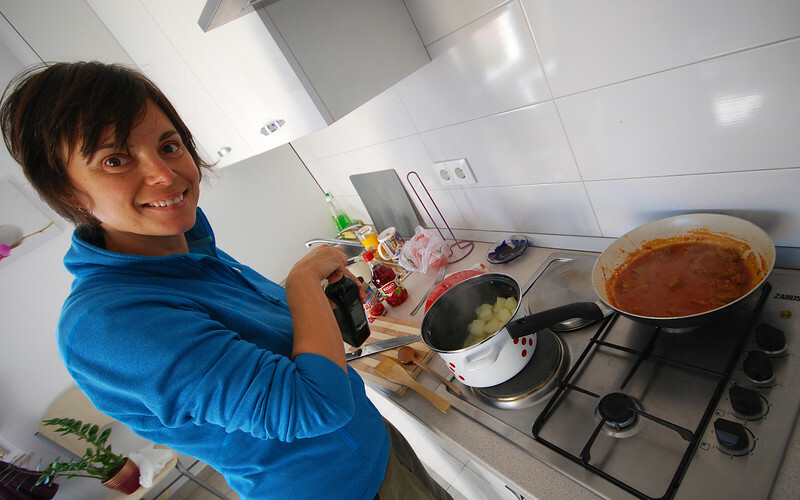 After six months of eating out in SE Asia, we are back to making our own food every day. Much more healthier! 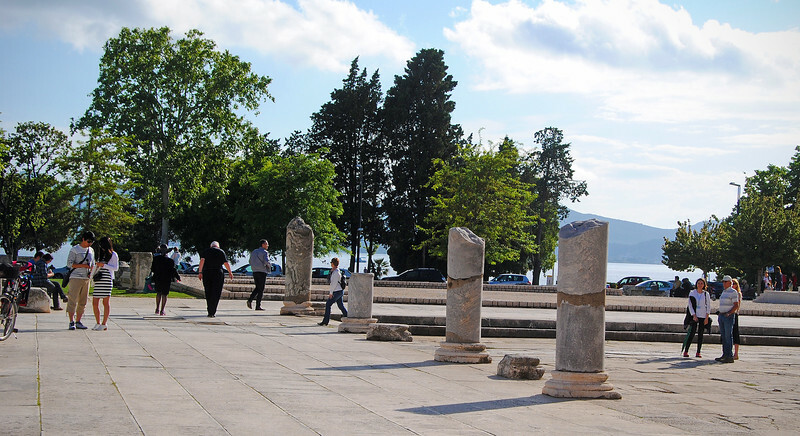 Zadar has much of the same familiar, Roman architecture as Pula. 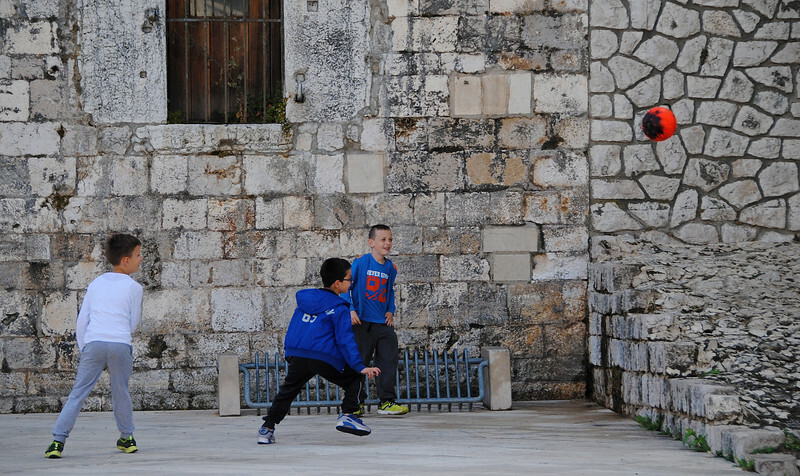 It seems a bit more cleaner and taken-care-of than Neda's hometown. 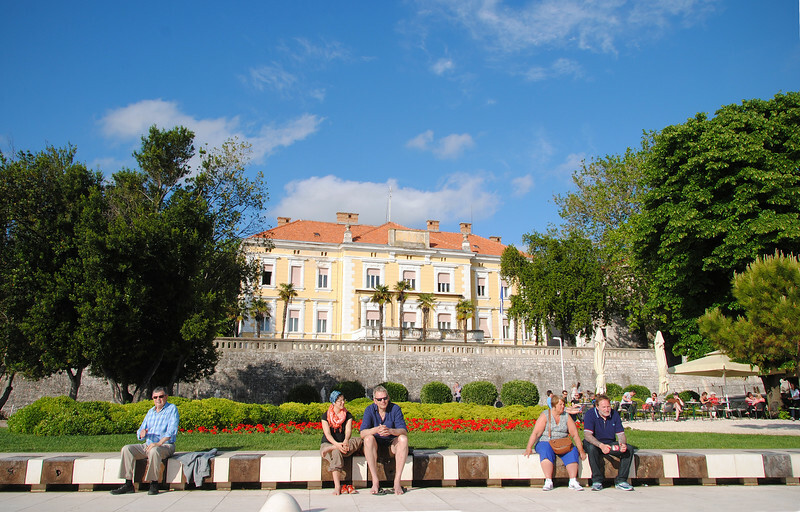 Tourism is such a big industry in Istria and along the Adriatic coast, that there is a struggle amongst all the towns and cities for government funding to maintain their old historic centres. 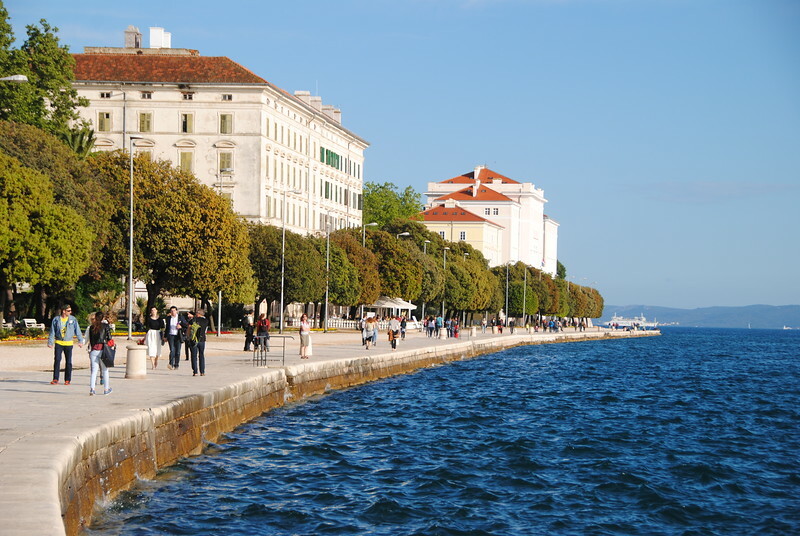 I recall sitting in on many conversations with the Pula girls and they're always complaining that Rijeka gets the lion's share of the funding, leaving their hometown to rely solely on the drawing power of its beaches. 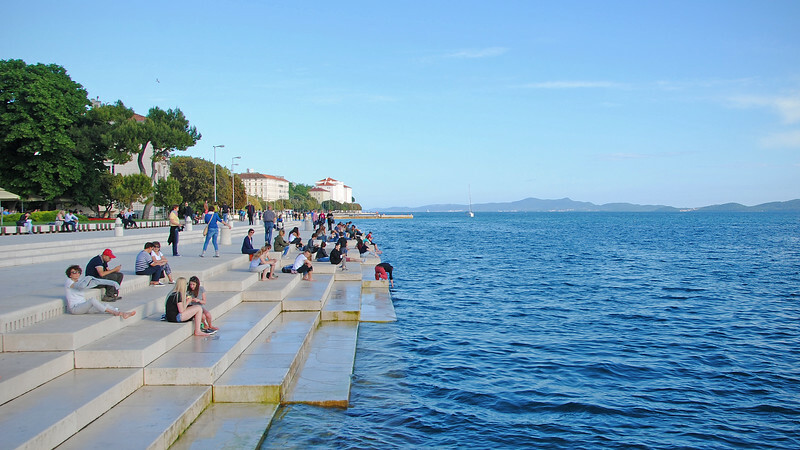 Zadar marks the beginning of Northern Dalmatia. 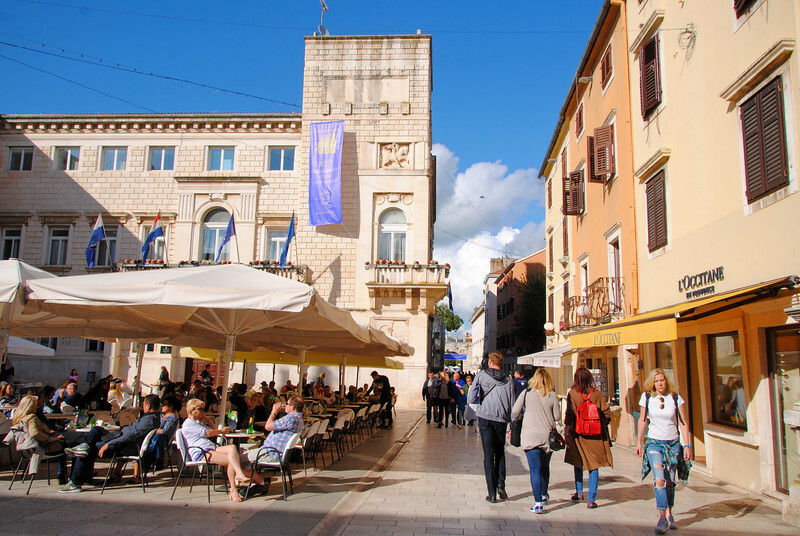 It's not as recognized as the major cities further south, like Split and Dubrovnik, so it gets fewer foreign tourists. 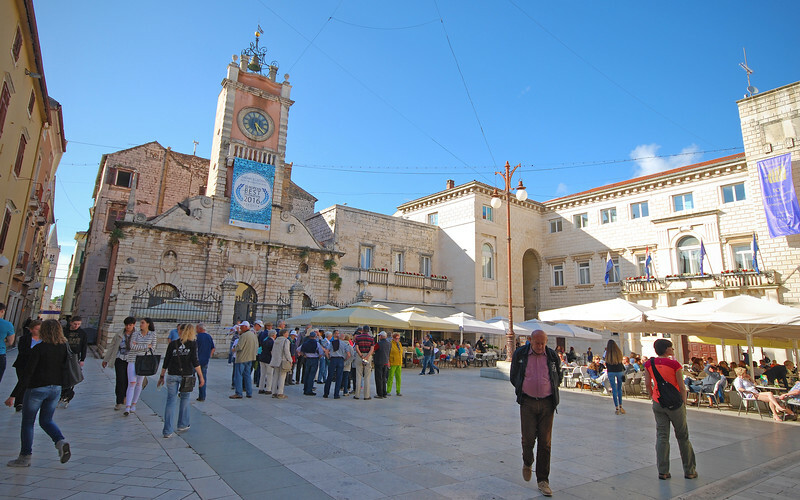 Also, it's still early on in the season, so the pedestrian-only streets of the historic centre aren't as crowded. Which suits us just fine. 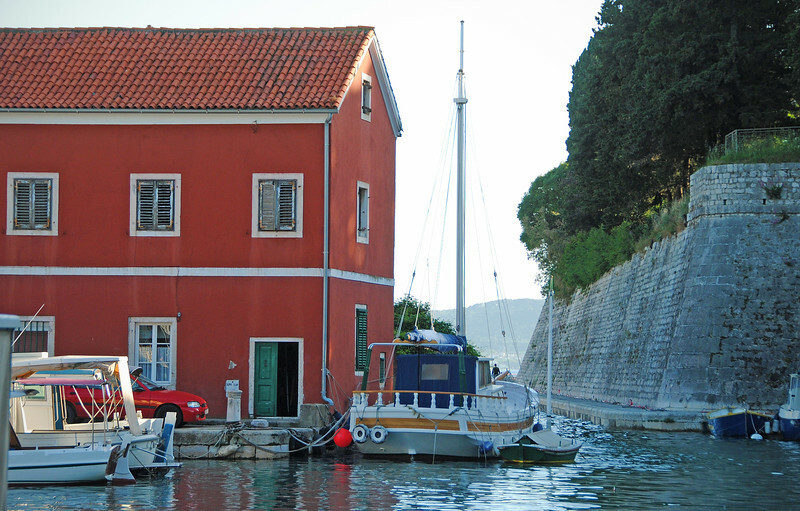 Our apartment would probably be a lot more expensive and also booked up if we had visited a month later. 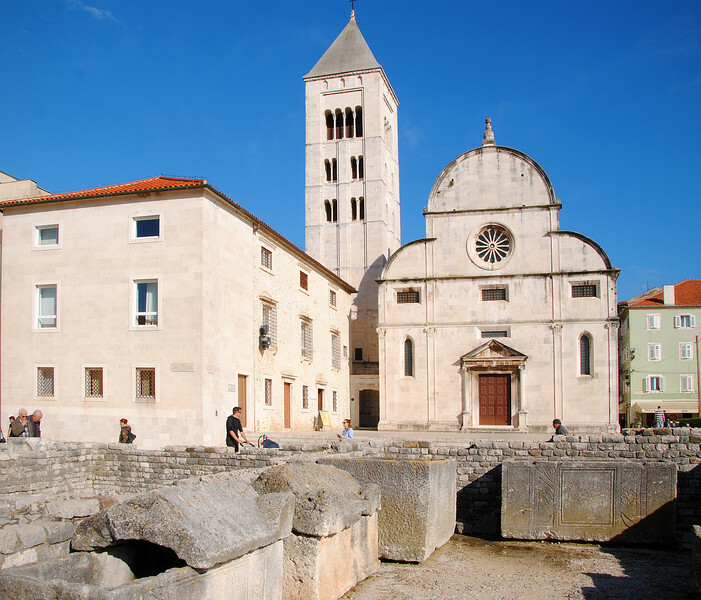 In the 16th century, Zadar was under siege by the Turkish. They withstood the attack by building a huge water sistern with five wells lined up in a row. 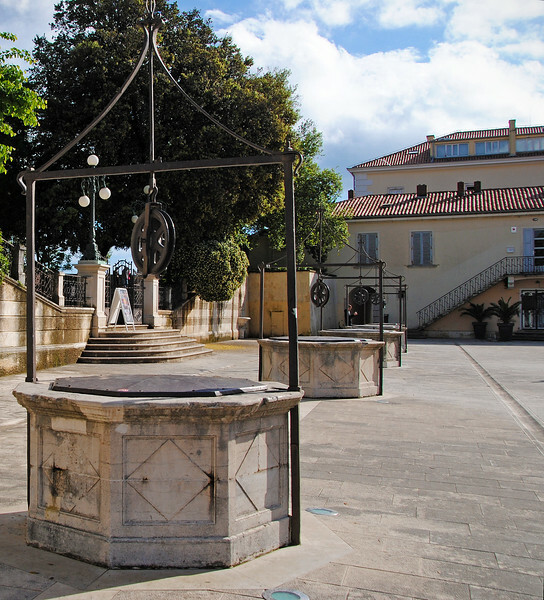 The wells are no longer functional, but the square is now popularly frequented by local skateboarders. I can't believe the weather we're having. After so long riding through burning season in Thailand, it's so unusual to see brilliant blue skies overhead! We are lapping up the good weather like thirsty dogs. With our luck, we never know how long this good fortune will last. I say this within Neda's earshot. I feel confident in saying the Pula Amphitheatre is waaaay better than Zadar's Roman Forum. Totally. 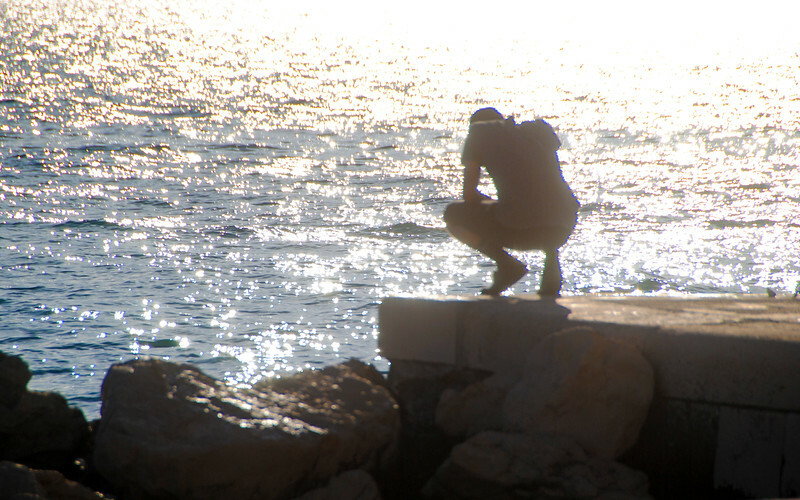 The warm sun is coupled with the cool breeze coming off the Adriatic Sea. 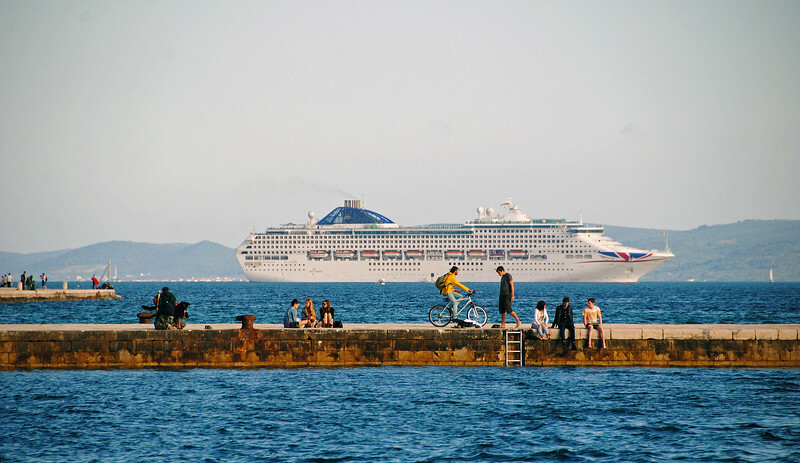 It's such a lazy day, taking a slow stroll along the coast, while people-watching and peering over the waterfront into the deep blue waters. Waves lapping towards the shore hit 35 harmonically-tuned tubes underneath the concrete boardwalk, forcing air up through whistles in the sidewalk above. You can see the whistles on the top step in the picture above. Depending on the size of the wave and which tube it hits, a series of notes are played either singly or in chords. 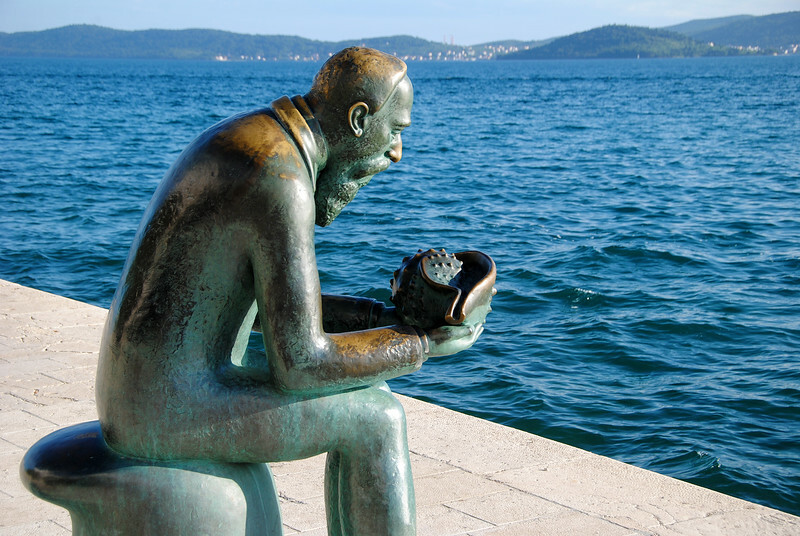 Nikola Bašić, the artist who created the Sea Organ, also designed another sculpture nearby, called Sun Salutation. 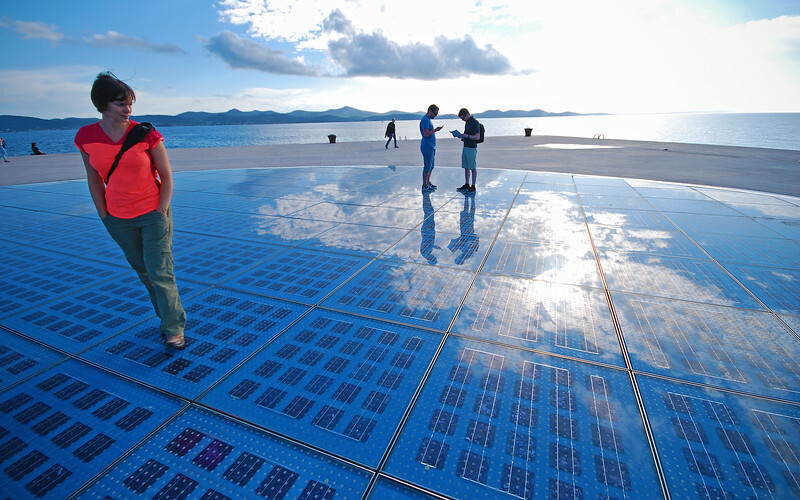 It's a huge round circle of blue photovoltaic cells that charges up a bank of batteries throughout the day. When night falls, it releases all this pent-up energy in a dazzling display of disco-inspired lights. 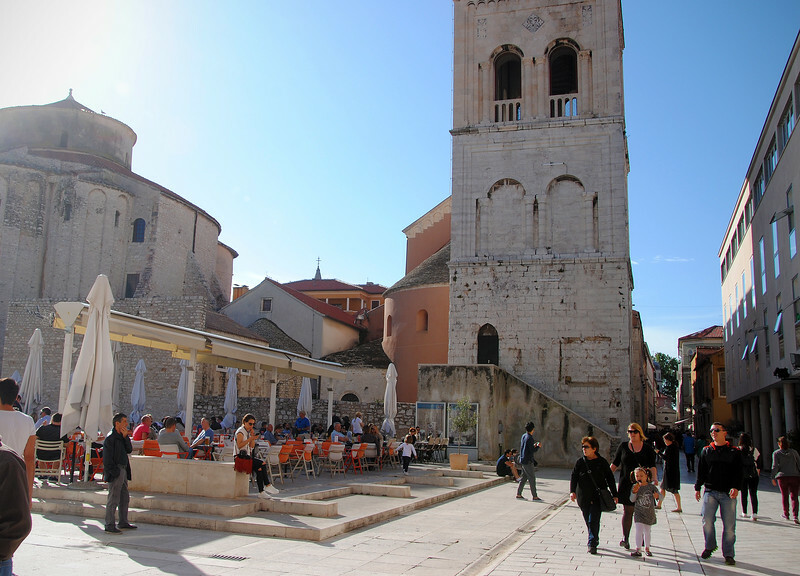 Not that we were trying, but it's lucky our visit to the historic centre was between cruise ship stops. Just can't handle the crowds spilling out of these behemoths! 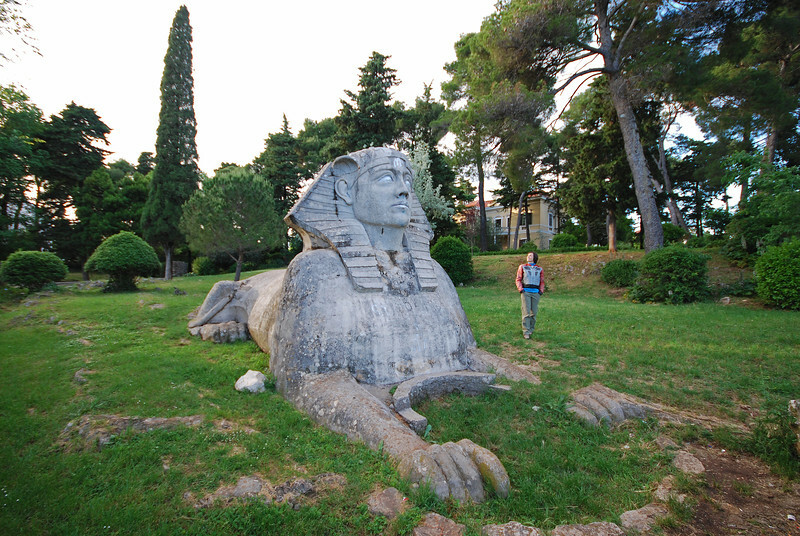 Neda found out there's a Sphinx in Zadar! A local artist built it in 1918 as a memorial to his wife. It used to protect a goldfish pond between it's paws, but the pond has long since vanished. 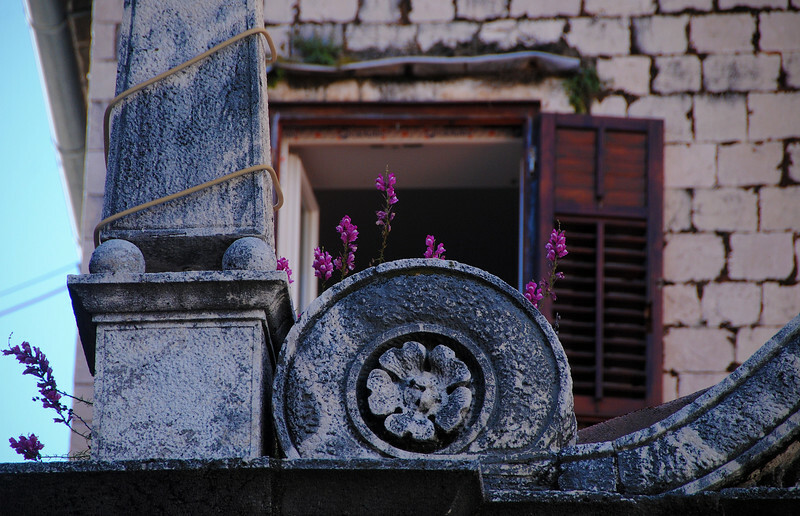 The sculpture is tucked away on one of the beautiful estates in the Bay of Maestral just outside the historic centre, and we saw it while riding around town. I hope we get to the see the bigger version in Egypt one day. Ever since leaving Chiang Mai, I've been in charge of our route all throughout SE Asia. Such a relief to relinquish the reins and have Neda do all the planning and logistics. It makes sense, since she speaks the language, but it's really nice just to relax and follow for a change. "Ready to go? Where to next, Neda?"